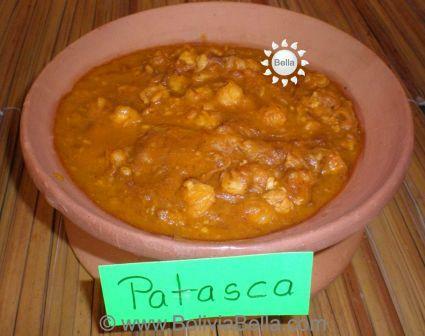 Patasca - Pork, Sheep or Beef Head Stew. Bolivian Food and Recipes. If the idea of skinning a animal head makes you queasy, you'll find an alternative below. But if you are able to get past that, this is a very good and very popular stew in Eastern Bolivia. The word "patasca" allegedly means "to burst". This recipe uses hominy which, when cooked, becomes bland and bursts open. Peruvians also make patasca, although in some regions of Peru they sometimes call it "mondongo" when made with a sheep's head. If you can't purchase a whole head, you actually can make this recipe using simply cuts of beef, lamb or pork. The recipe uses Chef Noly's favorite ingredient: wacataya! If you use a whole pig's head for this stew, you don't have to peel the skin from it, but if you use a whole cow's or sheep's head you'll need to skin it first. If you use real mote (large kernels of hard, dried white corn) you'll need to soak these overnight and cook them along with the head. If you use canned hominy for this recipe, add it toward the end of the cooking, when you add the "ahogado" (see below). Cook the head in a very large pot with sufficient water to fully cover it. Once the head has fully cooked (about 1-2 hours) and the meat has softened, you can remove it from the water, cool it, and remove the bones. Return the meaty portions to the stew (Bolivian cooks often cut the brain and tongue into small pieces before returning them to the soup). In a separate small pot, place about 2 tablespoons of shortening, the spices, diced onions, tomatoes, crushed chile, spearmint and wacataya, and sautée until it is all very soft. This mixture is what gives the stew its flavor and in Spanish is called the "ahogado". Add this to the stew and cook until fully incorporated, about 1/2 an hour longer. Serve your patasca very hot.